As one male tweeter put it: "Serena Williams won a grand slam while she was pregnant so every man should probably shut up about everything forever." 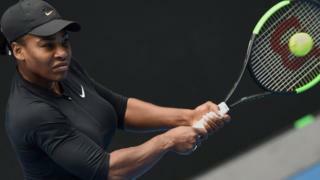 The US tennis player's announcement that she is 20 weeks pregnant means she won her record-breaking 23rd and most recent Grand Slam singles title at the Australian Open while eight weeks into her pregnancy, at the age of 35. On social media, the revelation has prompted both men and women to claim she is the GOAT - greatest of all time - and worthy of immense admiration. Women queued up to express their comparatively shameful attempts at exercise. "Sometimes I get a little winded when I try to just talk and walk at the same time," one tweet gasped. The plain fact is that doing anything much during the early stages of pregnancy can be a challenge. Getting out of bed? Possibly. Making it to work? Maybe. Eating breakfast? Forget it. And that's because the female body is undergoing a massive physiological transformation. Even before any kind of bump is visible, hormones are surging and raging, causing dramatic changes in the way the body functions. During the early weeks, most women experience fatigue at some point caused by rising levels of hormones progesterone and oestrogen. The advice is usually to rest - but clearly not in Serena's case. Many women also suffer from nausea or morning sickness, which doesn't conveniently end at midday, and a small number of women are affected very severely, needing hospital treatment. Vomiting or retching is a daily hazard for the majority, sometimes before a test has even confirmed the pregnancy. But even if Serena was lucky enough to sail through the first few weeks unscathed by nausea, she would still have had other physical changes to contend with. These include the breasts becoming tender and swollen very early on, a need to go to the loo more often and sudden aversions to food and odours. During pregnancy, the amount of blood in the body increases, causing the kidneys to process extra fluid that ends up in the bladder. Pregnancy hormones can also cause constipation and heartburn as the body gears up to cater for a growing foetus. And research shows that from the fifth week of pregnancy, Serena would have experienced substantial changes to the cardiovascular system, which delivers blood supply to the foetus. Exercise is a good thing and is not dangerous for your baby, the NHS Choices website says, and it encourages women to keep active for as long as it's comfortable to do so. Serena's fitness levels and training regime may well have helped her through those early stages. However, a woman's brain undergoes a bit of rewiring too. A recent study found that pregnancy reduces grey matter in some parts of the brain, helping women bond with their baby and prepare for the demands of motherhood. In fact, the researchers said the scale of the brain changes during pregnancy were akin to those seen during adolescence. And that could explain why so many women experience mood swings during the early stages. So Serena could have been forgiven for being more than a little distracted at the Australian Open, where - incidentally - she didn't drop a single set. But of course she is not the first woman to compete at an elite level when pregnant. Marathon runners, including Paula Radcliffe, often continue running well into their pregnancies. There have been examples of women competing in Olympic disciplines such as shooting, archery, curling and equestrianism who have all taken part while pregnant. Professor Janice Rymer, of the Royal College of Obstetricians and Gynaecologists, said: "For elite athletes, a tailored training and nutrition plan would normally be developed with a specialist team. High levels of exercise at around eight weeks gestation should not affect pregnancy for these athletes and those used to high levels of exercise. "During the first few weeks of pregnancy these hormones may actually boost physical performance as a woman's natural production of steroids will increase slightly. "There are many health benefits to keeping active during pregnancy including a reduction in fatigue, lower back pain, varicose veins, and swelling of the ankles." And yet Serena has clearly achieved something special because she is right at the top of her sport, winning more grand slam titles than other player in the Open era. If she takes less than 12 months off following the birth of her baby in the autumn, she will be allowed to keep her current ranking - which moves from Number Two to Number One in the world on Monday.